Everyone wants to know how to make his or her business leaner. Amazon has more than 9,000 books on lean. But once you've decided to ditch your master plan to promote streamlined flexibility, there's another way to look at what it really means to be a lean organization. This approach goes far beyond paying lip service to the concept, because when approached strategically, the lean agenda has the potential to reduce the length of certain processes from months to hours. It all boils down to one key distinction: Will you structure your business to maximize resource efficiency or flow efficiency? These concepts are examined in detail by Niklas Modig in his groundbreaking book, This Is Lean: Resolving the Efficiency Paradox. Modig defines resource efficiency as a measure of the extent that a company's resources are used in its processes. Flow efficiency, on the other hand, is seen as a measure of how quickly and seamlessly a company fulfills specific customer demands. In other words, one has a greater impact on your immediate bottom line, while the other focuses more on what your customers really care about: How quickly can we get value from the company? To help business owners understand how to optimize their operations along these two axes, Modig developed an "efficiency matrix." 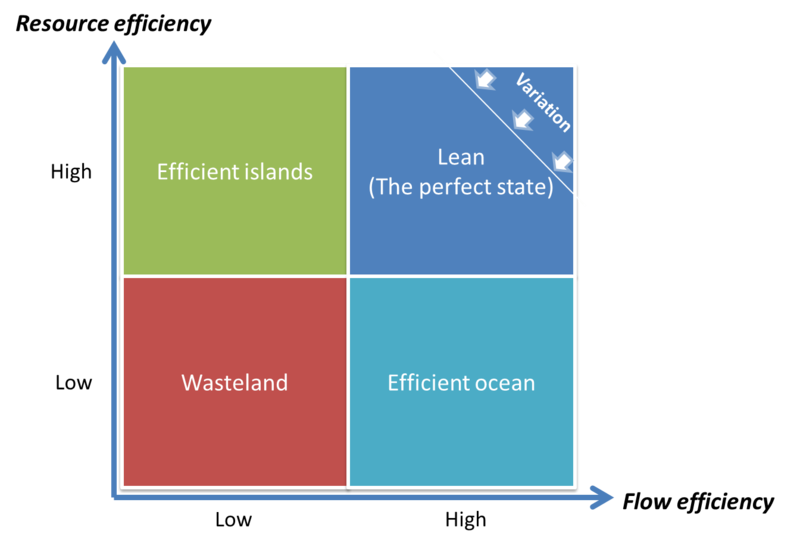 Companies focused entirely on reducing costs find themselves in the upper-left quadrant (efficient islands), while those focused entirely on delivering customer value as quickly as possible end up in the bottom-right quadrant (efficient ocean). The perfect state is only achieved when balancing high degrees of both strategies, and the tradeoffs found therein. Under the right circumstances, each approach can help your organization become leaner, because both are about eliminating waste. Yet many leaders fail to understand that these two types of efficiencies actually have competing interests; hence the "paradox" and the need to understand which you should emphasize to achieve corporate goals. If you find yourself in the upper-left wanting to move to the upper-right, you'll probably have to take a U-shaped path (through the "wasteland" and the "efficient ocean") to get there. But once you do, it will be well worth it. 1. Remember that time is money. It's clear that lean is about eliminating waste, but it's not always a given which area to target for a starvation diet. Generally, when people think of lean organizations, the focus is almost always on cost: trying to do as much as you can with as few resources as possible. But another form of waste that significantly impacts the customer is time. How long does it take to deliver a new feature--or any kind of increased value--to your customer base? If you're building a business in which offering functionality quickly to your customers is the primary value behind it, then it makes sense to put greater emphasis on expediency and perfecting the customer's experience than on immediate cost-savings. Making this investment in ideal flow means you're developing happier and more loyal customers, because you're constantly delivering value to them--turning time into money down the road. 2. Go with the flow. Creating a lean enterprise focused on delivering value to the customer as rapidly as possible usually means sacrificing a singular focus on resource conservation. You'll need to spend more money on your teams to maximize how well processes flow to satisfy the end user, because you typically need more people, more robust teams, and more cross-functionality to optimize flow. Despite this reality, most enlightened companies tend to migrate toward flow efficiency over time, because that's what helps them build the most sustainable, successful business long term. This often means hiring more people and removing shared resources across teams as much as possible. For example, consider the scenario in which several teams share a single graphic designer. If demand for that person's time causes the teams to have to wait at various stages of their processes, then hiring a dedicated graphic designer for each team could improve the entire group's flow efficiency. Ultimately, lean is about making tradeoff decisions like this. For our entire first decade at Pluralsight, we focused almost exclusively on resource efficiency. Our group of founders launched the company with just $5,000 each--and beyond this initial capital, we never took any outside funding throughout this 10-year period. Our goal was to try to do as much as we possibly could with very little. Only within the past year have we started to move more aggressively toward flow efficiency, which has been supported by our growth and venture financing. 3. Understand the tradeoffs. The health care system has traditionally revolved almost entirely around judicious use of resources. In This Is Lean, Modig gives an example of a woman who finds a lump in her breast and wants to find out if she has breast cancer. One option she has is to visit her primary care physician. This decision generally unfolds into a series of handoffs and referrals that require her to visit various hospitals, clinics, and specialists for tests that may lead to inconclusive results. The whole process can take weeks or months before arriving at a diagnosis. This type of scenario is resource efficiency at its finest. Though in this example the facilities themselves are efficiently run in terms of prudent use of resources, this very efficiency tends to increase the amount of work there is for each part of the care continuum to perform. The result is a significant lengthening of the end-to-end process for the patient and how quickly she receives "value." If, on the other hand, the woman visits a one-stop breast cancer diagnosis clinic, where all of the doctors, specialists, and equipment work together as part of a truly flow-efficient process, that same woman can have a diagnosis in a matter of hours. That's because the patient's desire for timely diagnosis and treatment are factored in first, ahead of optimizing the various resources--and that's ultimately the "value" this clinic sells. 4. Map things out to find "value." An easy way to figure out if you have opportunities to improve flow efficiency within your various processes is to do a value stream mapping. You can do this by writing down the various steps of any process, including dependencies on external teams and resources. Pay attention to who does the work at each step and how long it normally takes. Even more important, document the waiting time required for handoffs from other teams before the process can continue. Once you have the entire process mapped out, analyze each step to determine how much of the work actually adds value for the customer. This analysis is key. You'll probably be surprised to find that many steps in your processes add no value from the customer's perspective. These areas represent golden opportunities for improving your company's flow efficiency. Simply remove these extraneous steps--stop doing the work--and see if anyone notices. We recently used value stream mapping at Pluralsight for a new website that we'd been working on for more than 18 months. When we completed our analysis, we learned that had we made different choices with a tighter focus on flow efficiency, our project could have easily been completed in just two to three months--a fraction of the time. 5. Scrutinize your goals. Resource efficiency is not all bad--nor is flow efficiency all good. What's important is to reflect on the perfect balance of these strategies for your company at any given time. You can apply the same ideas from the health care example to any business, since we all face the same tradeoffs. As we increase our focus on flow efficiency at Pluralsight, we're thinking more and more about how quickly we can absorb new ideas from our customer base around their preferences for new courses in our training library. This is leading us to more cross-functional teams--with people from content, product, engineering, support, and sales all working together, focused on maximizing the flow of value to our customers as quickly as possible. In most organizations, the key to understanding lean is recognizing that it really comes down to making the right tradeoff to help your company reach its unique goals. Complete optimization for one approach versus the other is missing the point. What matters is an ongoing search for optimal balance at any point in time, and knowing what really matters to the customer.